I am always looking for the ultimate rust protection for my car, I have tried endless treatments in the past and all have been rubbish, The last couple of years there seems to have been a major step forward with the treatment of rust. The big players seem to be POR, Granville and Rustbuster. 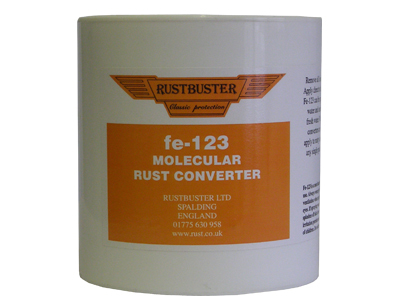 This review will look at the Rustbuter FE-123 as a product. I have compared the products via my YouTube video for the results. I tried and wanted so much for this product to be great. I have attached the PDF of the of the Practical Classics Article. The pot has a single label on the front that says how good it is and that is basically it. The label goes on to say that it can be diluted up to 50% in order to make it into a cavity spray. and that is a great idea. Suggests this stuff is supper strong. There are no storage suggestions for the product. The application is done via a brush, this rapidly turns the rusted area into a black treated area that will protect the metal or molecularly convert it into a safe metal again. A single application of the milky type substance is all you need. The coating creates the transformed material into a black metal again. I treated a sheet of metal that I left in the garden for a coupld of months doing nothing else to it. By the side of it I also painted the Granville Heavy Duty Rust Cure. After a period of a few weeks the FE-123 started to peel and crack of it’s own accord. I managed to lift part of the coating off and left it. I also did exactly the same to the Granville. My leave it in the rain and the sun test has allowed the rust back through the treated area. I was absolutely gutted as I bought a litre of this stuff for around £40. I wanted this stuff to work. It has been given winner awards and yet NOBODY is showing you the results later on from the initial test. I DO, and I made a video of it as well. I have inserted some photo’s of the test metal and marked with arrows the peeling coating and the rust spots coming back. The last two pictures are a close up of the FE-123 with the rust spots that don’t need pointing out! Why so bad? more like I was generous. I held the rust at bay for a few weeks, there again so will WD40. The coating split and the rust is back. As far as I am concerned left in the open for a year or so and it comes back – well maybe. Most of these cars go into a protected environment to be fair. So it shouldn’t make to much difference. BUT, when the product next to it is still as it was at the time I treated it – something is wrong. Would I recommend it? If it was a real cheap bargain then yes for the shed hinges. would I buy it again. No. Granville is the same price basically and it is a far superior product. Granville is used by MoD and NATO, Rustbuster can’t claim that can it? The Rustbuster website says very clearly that this product is meant to be painted over with a primer and then a topcoat. You have not followed the instructions, so should not be surprised that the product has not performed as expected. I think you miss the point. If the molecular transformation is not what it should be to the metal, the rust will come through under the primer and undercoat. Practical Classics never applied the primer or top coat either during their tests, hence why I wanted and challenged them to see their results.The application process on the pot does not tell you to apply a primer or a top coat either, if this was critical it should be on the product. ALSO if this was to be used as a cavity treatment as the product suggests, then the process of the product only applied as I have done here will be representative of the results. Would you apply primer and top coat into a cavity? Sorry I’m a year late on this one ! Great article, so valuable when thinking of buying these expensive products. I use POR15 products but was looking for an easier single application method than the 3 step needed by POR which needs to dried thoroughly between each one. However, reading this has confirmed that it is worthwhile using POR. I too applied 1 coat of POR to a couple of rusty metal test pieces 10 years ago without the proper preparation and to this day they are still sat in a cold garage drawer completely rust free. It does explain on the tin that its one weakness is direct UV light, however most applications will be underneath the car I would expect. One good piece of advice – never replace the POR paint lid without a couple of layers of cling film – otherwise it will literally weld itself shut! Thanks for the comments Paul. I suspect that you could be right with the UV light but the POR15 was exposed at the same time. I was bitterly disappointed that this didn’t work. On my Mustang I treated the rear brake drums with it and that was out of the sunlight., and guess what I noticed a few weeks ago before I put the car away for the winter? Yep rust specks showing through. I will restore them over the winter on a nice day. Didn’t work for me either. Application requirements are far two restrictive. It might work under ideal conditions but not for DIY. Built Hamber hydrate 80 is much easier to apply and cheaper. Hi Philip, thanks for the comment and recommendation. I was so disappointed with the results, sorry it didn’t work for you either. You’re right and I totally agree with you about the restrictions though. What a great review. Thanks for bothering. I shall try the POR-15 if i can find it. “New metal” is not an option. I shall try to look for more of your reviews but am not very internet savvy. But thanks again. I never found ANY rust treatment that lived up to its claims either. Hi Gregory, Thank you for the comments and is much appreciated. The test of time will be the only way to tell if this stuff is any good or not. But I have some apinted on an old fender splash guard, where the POR15 was painted it has not rusted through (yet). The other rust treatments Granville Rust Cure & FE-123I have indeed rusted just as bad as it was before, in my opnion they proved to be a complete waste of time. I am working at Dinitrol and can tell you that neither Rust-buster or Granville hold a NATO number. If people want to be sure please check the card core test facts. Thanks Niels for letting the readers know. They are not what they seem to be in the long run that’s for sure. I was quite disappointed too. No problem. We need to share this knowledge in the real world scenarios. As far as I am aware FE-123 should be over-coated with paint. I suspect it is not UV stable and that may be why the coating broke up when you left it in the garden. I followed the instructions on the pot that’s all I can do when doing these things. It did not mention the over-coat required unfortunately. If that is the case then the Rustbuster is even worse than I thought it was. The Granville did not need over painting. POR15 also explains on the tin the process that should be used including the UV aspects. If Granville does not mention the full steps then I am not to blame I am glad to say. Can I assume that you got in touch with Practical Classics magazine as well to tell them about the over-coat? I would be interested in what they also had to say as they didn’t over-coat their test metal either, if they did then they didn’t say it. Thanks for your feedback though.